A top executive of China's Huawei Technologies argued that she should be released on bail while awaiting an extradition hearing, citing fears for her health while incarcerated in Canada along with other factors, court documents showed on Sunday. Huawei CFO Meng Wanzhou is fighting to be released on bail after she was arrested on 1 December in Vancouver at the request of the United States. Meng, 46, faces U.S. accusations that she misled multinational banks about Huawei's control of a company operating in Iran. This deception put the banks at risk of violating U.S. sanctions and incurring severe penalties, court documents said. China has criticised her detention and demanded her immediate release. The arrest has roiled global markets as investors worried it could torpedo attempts to thaw trade tensions between Washington and Beijing. In a sworn affidavit, Meng, the daughter of Huawei's founder, said she is innocent of the allegations and will contest them at trial in the United States if she is surrendered there. Meng said she was taken to a hospital for treatment for hypertension after being detained. She cited hypertension as a factor in a bail application seeking her release pending an extradition hearing. She also said she has longstanding ties to Vancouver dating back at least 15 years, as well as significant property holdings in the city. 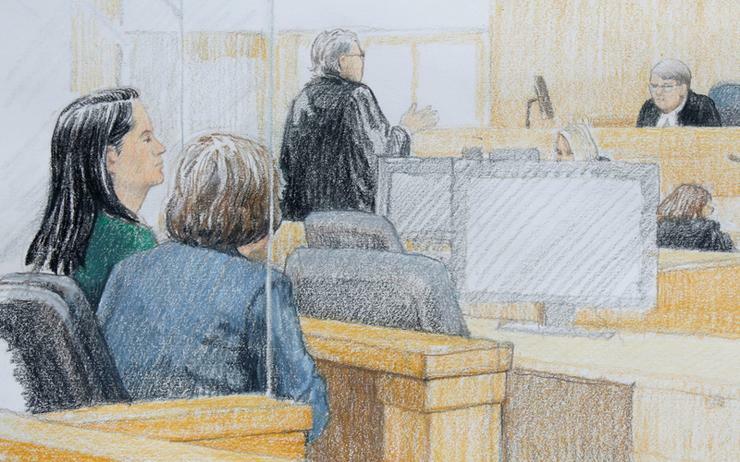 Her family also sought leave to remain in Vancouver if she was granted bail, according to the court documents, with her husband saying he plans to bring the couple's daughter to Vancouver to attend school during the proceedings. Earlier on Sunday, China's foreign ministry summoned the U.S. ambassador to lodge a "strong protest" over the arrest, and said the United States should withdraw its arrest warrant. Chinese Vice Foreign Minister Le Yucheng told U.S. ambassador Terry Branstad that the United States had made an "unreasonable demand" on Canada to detain Meng while she was passing through Vancouver, China's Foreign Ministry said. "The actions of the U.S. seriously violated the lawful and legitimate rights of the Chinese citizen, and by their nature were extremely nasty," Le told Branstad. He made similar comments to Canada's ambassador the night before. China strongly urges the United States to pay attention to China's solemn and just position and withdraw the arrest warrant on Meng, Le added. "China will respond further depending on U.S. actions," he said, without elaborating. Le also told the Canadian ambassador on Saturday there would be severe consequences if it did not immediately release Meng. The United States has been looking since at least 2016 into whether Huawei shipped U.S.-origin products to Iran and other countries in violation of U.S. export and sanctions laws, Reuters reported in April. In the Canadian court documents released on Sunday, Huawei said its Iran operations were "in strict compliance with applicable laws, regulations and sanctions" of the United Nations, United States and European Union. In a company presentation from 2013 that was released with the Canadian court documents, Huawei said it communicated with U.S. government agencies on a "day-to-day" basis to obtain what it called "professional guidance" on trade compliance. Companies are barred from using the U.S. financial system to funnel goods and services to sanctioned entities. U.S. Senator Marco Rubio said on Sunday he would "100 percent absolutely" introduce a measure in the new Congress that would ban Chinese telecom companies from doing business in the United States. "We have to understand Chinese companies are not like American companies. OK. We can't even get Apple to crack an iPhone for us in a terrorist investigation," he told CBS "Face the Nation." "When the Chinese ask a telecom company, we want you to turn over all the data you've gathered in the country you're operating in, they will do it. No court order. Nothing like that. They will just do it. They have to. We need to understand that." Rubio was a strong critic of China's ZTE, which pleaded guilty in 2017 to violating U.S. laws that restrict the sale of American-made technology to Iran.